The proportion of HIV-infected individuals who know their serostatus has increased in recent years, demonstrating progress toward the goal of expanded testing to reduce further transmission and link infected individuals to life-saving care. Being on treatment has the added value of serving as a prevention strategy, as individuals whose virus is fully suppressed are highly unlikely to transmit HIV to others. Despite this progress, work remains to be done. According to CDC, 40% of new HIV infections are transmitted by people who are untested/undiagnosed. Communities throughout the nation are working to enhance HIV testing in order to bring more infected persons into care. Below is a description of one such initiative, followed by a summary of available resources that agencies can use to improve their HIV counseling and testing activities. RAPID (Rapid ART Program Initiative for HIV Diagnoses) is a San Francisco initiative that has set up "hub" sites around the city to get newly diagnosed individuals on antiretroviral therapy immediately. RAPID is part of San Francisco's Getting to Zeroinitiative to reduce HIV transmission and HIV-related deaths in the city by 90% before 2020. RAPID resources include an illustrated guide on implementing the program at a site and Standard Operating Procedures. Other cities around the country are implementing similar programs. 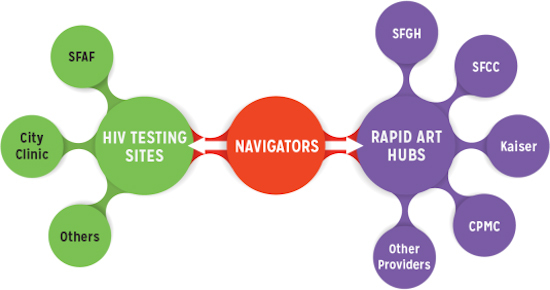 These programs require unprecedented coordination among testing sites, laboratories, navigators and outreach workers, and clinical providers. National HIV Curriculum. This online training tool's section on Screening and Diagnosis covers HIV testing in depth, including testing recommendations, new diagnostic tests and how to address the complexities of test interpretation. Section topics include: Epidemiology of HIV: HIV Screening Recommendations; HIV Diagnostic Testing; Acute and Recent HIV Infection; and Linkage to HIV Care. Resources for Clinicians. The AETC National Coordinating Resource Center has a topic page on the HIV Continuum of Care with a collection of clinician training materials (e.g., curricula, fact sheets, patient education materials) under the Continuum's Step 2: Identifying Cases through HIV Testing & Diagnosis. Regional and local AETCs regularly provide training on testing-related topics for clinicians. Clinician Consultation Center. The AETC CCC provides clinician-to-clinician expert advice on a broad range of HIV topics, including testing, care management, PrEP, PEP and more.